Recently, we have presented you how to automatically copy tasks between different Kanban boards using Zapier. Today, we would like to show you another possibility - how to set up an email notification that is automatically send to your email address when a card is moved to a specified column. It is particularly useful when columns on you board are assigned to team members or to specific company's departments (for example if you are using Heijunka board). The person or a department will receive an email notification right after a new task will be moved to their column. The procedure of setting up notifications is similar to the one we have explained in the previous post How to link tasks between boards using Zapier. 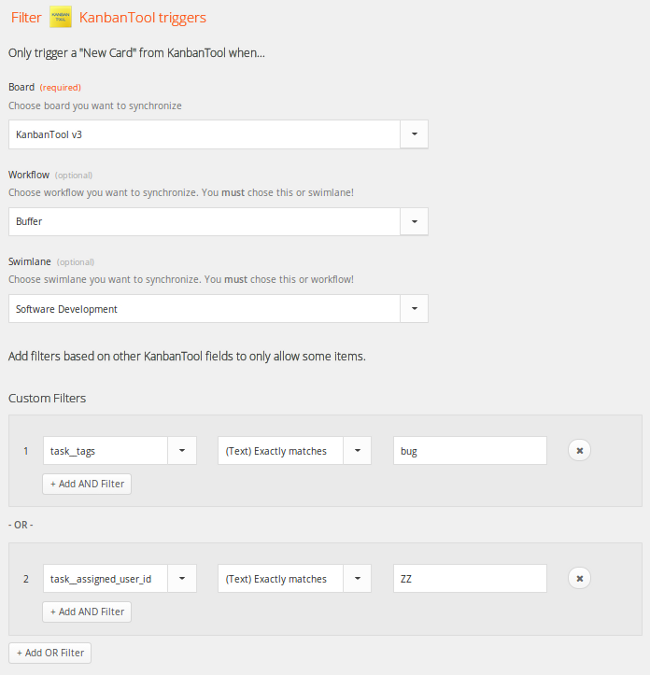 To start, create a Zapier account and paste your Kanban Tool API token on Zapier page. Next, choose a trigger and an action like on the picture below (of course, you can choose other email service). - To - who will this email be sent to? - Cc - who should be cc'd on this email? - Bcc - who should be bcc'd on this email? - From Name - this will be your "display name" when sending. - From Email - from email address. - Reply To - specify a reply address other than your own. - Attachment - a file object to be attached to the email. Plain text content will be converted into a txt file and attached. Please, note that each email field can be supplemented with information from the card.